How can we maximize the development impact of remittances? This was the key question of the fifth Global Forum on Remittances and Development, which ended in Milan last Friday after four days of substantive dialogue and debates. More than 400 participants attended from 88 countries around the world. In 2014, global remittances to developing countries reached US$436 billion, exceeding official development assistance by at least three times. The forum focused on how to leverage these funds for social and economic development in recipient countries. It is estimated that about 20 percent of the funds received could be invested in productive activities and small businesses. While today there is greater appreciation of remittances by governments and the international community than ever before, there are still many barriers that prevent remittances from meeting their development potential. Kanayo F. Nwanze, IFAD's President, opens the Global Forum on Remittances and Development. The forum started with the warm-hearted observance of the first International Day for Family Remittances. 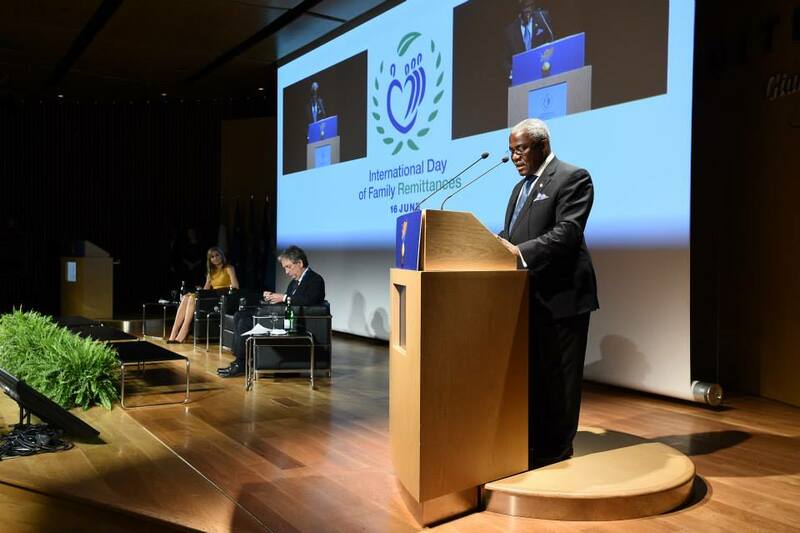 In his opening, IFAD President Kanayo Nwanze reminded the audience that remittances are the largest poverty alleviation mechanism adopted by millions of migrant workers around the world in benefit of their families back home. 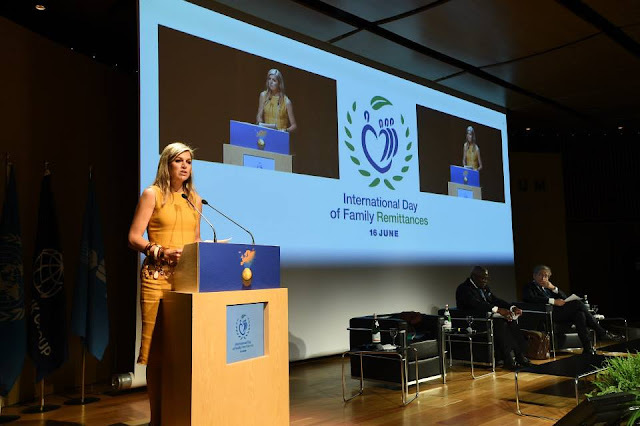 In her keynote address, Queen Máxima of the Netherlands, speaking in her role as the United Nations Secretary-General's Special Advocate for Inclusive Finance for Development, also acknowledged the importance of remittances. "We should never forget that to millions of families in developing countries remittances represent their only hope for building a better future", she said. Participants rallied around the need for more proportionate regulations and a more enabling regulatory environment for remittances. In particular, payments systems should be more integrated and adapted for transfers of small amounts of money. The issue of de-risking was much discussed and will remain an area for future work. Money transfer operators and companies present at the forum called for the opening of a dialogue with regulators. De-risking is the closing of bank accounts of money transfer operators, which they need to operate, by banks due to perceived legal, regulatory sanctions and anti-money laundering/countering of financing terror measures. There was a wide consensus on the promise of technology to provide cheaper, more efficient and far-reaching remittances. The use of mobile and online technologies has led to a transformation of the landscape for domestic remittances in many countries, for example in Kenya. Their use in cross-border transactions, however, remains limited and is hampered by the lack of international interoperability of mobile systems and of regulation harmonization between countries. The value of international remittances sent through mobile phones accounted for less than 2 percent ($10 billion) of global remittance flows ($542 billion) in 2013, according to the World Bank. Public-private-people partnerships and dialogue with migrants and recipient families were the leitmotiv when discussing concretely how remittances can harness development locally. The private sector is very key in that respect. By providing access first to savings accounts and then loans and insurance, banks and money transfer operators can offer millions of people the possibility to invest, develop their activities and start small businesses. Currently only about 10 per cent of rural people in developing countries have access to even the most basic financial services. Participants discussed how to go beyond pilot activities and take proven models and scale them up to maximize development. The IFAD Financing Facility for Remittances is launching a call for proposals to that effect. Guidelines will be published in September 2015. While progress has been made to reduce transfer costs in recent years, more should and can be achieved through increased competition and the introduction of new technologies. With a global average of about 8 percent, costs remain too high and are much higher in many places, for example in Africa. It was agreed that joint efforts need to be pursued to reduce transfer costs, to increase the use of new technologies and to improve financial inclusion. Particular attention also should be paid to the role remittances can play in the post-2015 development agenda and their contribution to the sustainable development goals. The next global forum will take place in New York in 2017 to assess progress towards the goals related to remittances. The forum closed with a ceremony to recognize practices that make a real difference to migrants and their families. The FFR gave four awards for efforts to help leverage remittances for development. Awardees were: WorldRemit, the world’s largest mobile-centric money transfer service; Mame Khary Diene, CEO of Bioessence and a successful diaspora entrepreneur; the Central Bank of the Philippines which set up a Economic and Financial Learning Programme one component of which targets overseas Filipinos and remittance-recipient families; and the non-profit Asociación Mexicana de Uniones de Crédito del Sector Social (AMUCSS), a network of rural financial institutions and micro banks.